CiviCon 2013 is coming up soon -- April 25-26, 2013 -- in San Francisco. The conference provides a great way to learn more about CiviCRM and see how it's used in many organizations. Use the zip button to download a current package and install it in Joomla. Please file any support related issues in the Github tracker. I am pleased and excited to announce the release of Using CiviCRM, a new book I co-authored with Joe Murray and published by Packt Publishing. 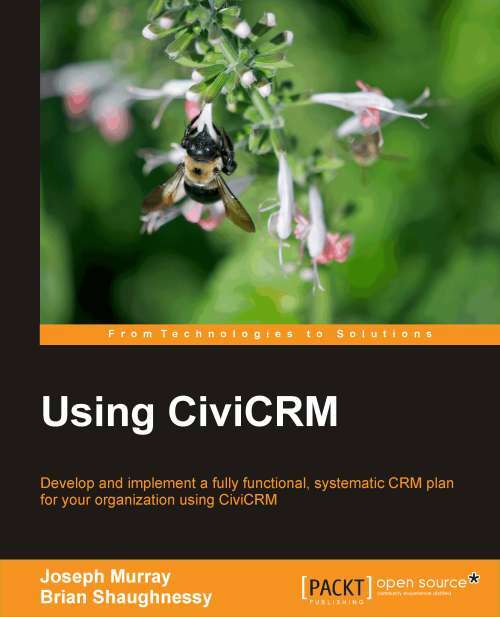 The book was the culmination of many hours of writing and reviewing, and a joint committment to advance the CiviCRM project through publication of the first commercial book. It is comprehensive -- covering all of the CiviCRM extensions and walking through both the business side of the equation (understanding your internal policies and procedures, business models, etc.) and the technology side (how these business practices equate to CiviCRM structures and methods). Geared toward implementers and users who wish to deepen their understanding of the software and become power users, the book is filled with how to's, best practices, and a case study woven throughout the text to help put the raw concepts into a real-life application.